Description: Grevillea ‘Dorothy Gordon’ Discovered in 2006 in the Myall Park Botanic Garden in Queensland, Australia, the home of ‘Robyn Gordon’, ‘Sandra Gordon’ and ‘Merinda Gordon’. This particularly attractive chance seedling is believed to be the result of natural cross-pollination of G. sessilis and G. paradoxa. It is named for the late botanical artist Dorothy Gordon. It was first released in 2014. 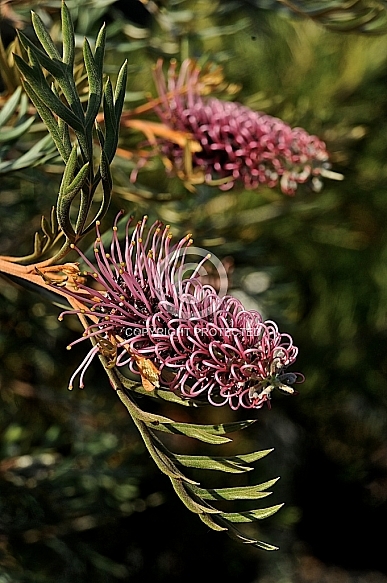 This hybrid grevillea forms a neat, large shrub of up to 3m in height and 2m in width. The fern-like foliage is grey-green in colour, while young growth is an appealing, soft bronze shade. The two-toned flowers of pinkish-lavender and burgundy are produced for much of the year and provide copious quantities of nectar for birds, small mammals and insects. A yearly light pruning will encourage prolific flowering and a compact growth habit. Typically, well-drained acidic soils and sunny positions are preferred. Light frosts are tolerated.